The Best Giant Outdoor Board And Toss Games For Your Backyard! The best Giant Outdoor Games, Go Big or Go Home! Bigger is always better, especially with it comes to the best giant outdoor games. These Giant Outdoor Games add an exciting element of fun to any gathering. They bring a larger then life experience to any birthday party, holiday, camping, park, or backyard. Everyone will love these giant outdoor games especially your kids. To make sure you maximize your fun at your next outing of future favorite Christmas present we prepared the best list with 15+ of the best outdoor toss and board games your kids will love. Something about stacking up Jenga up to 4 or 5 feet tall brings a hole new level of fun to the game. While at a family reunion this summer we all stopped and had play a few rounds. It is one of those games that you can make yourself but does take up a lot of room in the garage or backyard. However, the kids and all our fat fingered adult friends loved this version so much more. In fact, we have a full post on the Drinking Jenga game with unofficial rules you can view here. How high can you stack them? Get the price. You may be a little shocked why we are recommending a giant connect four games for your backyard, this is because we have one of the 4-foot sets in our yard and everyone loves it. There are many different types of game sets including wood or plastic, and both will last a long time as not left in direct sunlight. It is a simple yet very strategic game that has players taking turns to see who is the first to get 4 in a row either diagonal, Horizontal, or vertical. It is one of the top-rated board games for kids and one of our personal favorite. Get the price. There is beer pong and there is the yard pong! Instead of playing with little cups and ping pong balls we play with bucks and tennis balls. You know how much we live our beer pong accessories and have wrote several blogs about the beer pong rules, but it is even fun sober! Add a little water the bottom of each bucket for support and makes a fun, portable, and easy to store game that will be the hit at your next event. Get the price. Another giant board games that all kids will love! It is the same as the classic board game for kids but instead of using game pieces, you move along. This 10 X 10 Foot mat, with giant dice has you moving up or down shuts and latter’s instead interreacting with the game. Get the price. Did you know that there are 100+ games to play with a parachute? Well we may not have had time to write all 100, but we did write one with the best 25 parachute games for kids. From tag, to waves, to flyaway, and even sharks and lifeguards. Something about the brightly colored massive mushroom shaped parachute will have kids running from all over screaming in laughter. Best part is they can fold up in a drawstring bag so small that you may even forget in the backseat of your car. Get the price. These inflatable and fun filled bowling set are so large it makes everyone a pro! The only decision your kids will need to make is whether to bowl it versus kicking at. These are a perfect game that will want to your kids outside and moving, but fun for the whole family. Get the price. Tic Tac Toss is one of our favorite DIY giant games that you can make in under 20 minutes for less then $20. All you need is a 6 X 6 (or larger) tarp, duct tape, and about a dozen Frisbees. Essentially you are playing Tic Tac Toe but throwing frisbees instead of deciding where to place them. You can see both our both family friendly tic tac toss rules or drinking game variation. This is one of the best variations of ring toss we have seen. Instead of using the wood stakes and ropes, you are using more of a mini hula-hoop and flags. This way you can choose where to put your targets and to spread them out a little more. Get the price. 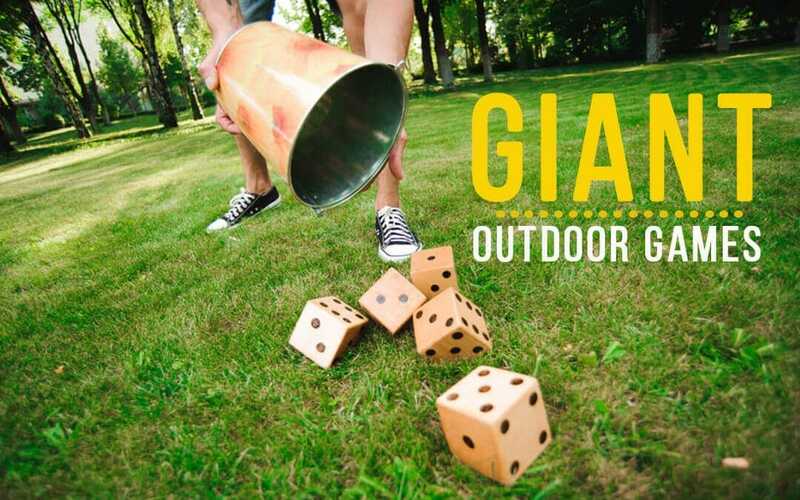 If you are playing any game outdoors, we think it should be mandatory that they are with giant dice! These large dice add extra fun to any existing dice game. From Yahtzee, Beetle, Bunco, or even monopoly need these. These are perfect for any tailgating or camping games. One of those must have games for kids that helps with hand eye coordination and is just a lot of fun. These 35 inches pick up sticks will have people of all ages have a blast while trying to pick up with poles without moving the others. Get the price. Checkers is a great game for any of our daughters. It is a game that is all about finding the right man to move. One of the giant 3 X 3 Foot Game Sets come with numerous games to play, and work as a matt to play or sit on. Get the price. This version of croquet is not only kid friendly, but adults love it as well. Same rules as traditional croquet but instead of using heavy mallets, kick large balls. It’s a mix between a fun version of soccer and croquet. There are 9 wicks in total with 2 flags and a fun and interactive introduction to one of the best backyard games. Get the price. Enjoy a fun game of extra large words! This game is great for adults who want to have a backyard game of Scrabble. But these tiles can also be great fun for teaching kids the alphabet or how to spell, for both inside and outside. You can get various sets, some with just the word tiles and others with scrabble matts included. Not only does this look great inside or out, but some may even use it as a decoration to spell out some of their favorite moments. Giant birthday party names perhaps? Get the price. Most of the time when playing football, you are trying to avoid the giant men, now everyone goes running towards this giant inflatable 4-foot football. This set comes with an inflatable tee for practicing your field goals as well as a pump. This is a fun pool game for kids and provides hours of entertainment for kids and the entire family. Get the price. I really think anything giant provides just that extra bit of fun. Whether it’s this giant inflatable football or a supersized giant inflatable beach ball. A giant beach ball takes a normal day into the beach into a jumbo good time! Not just a little big, but these giant balls can even be equal to your same height, up to 8 feet! People of all ages have so much fun kicking, chasing, and watching this ball fly. Just as fair warning it requires a lot of air, so make sure you at least have a pump if not electric. Add in some fun to your next pool party, beach day, or camping trip. Get the price.